So small and yet so large. 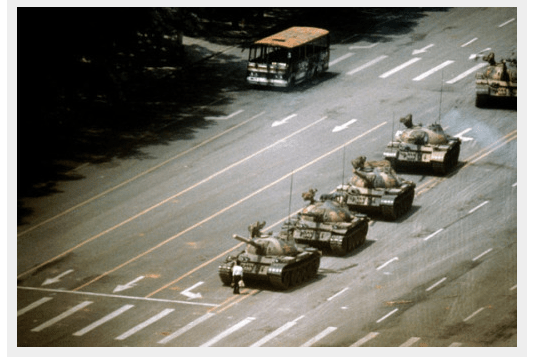 That photo is of course from Tiananmen Square, twenty-six years ago today, when the entire world watched an anonymous Chinese man stand alone in front of advancing tanks, not backing down in the face of communist totalitarianism. June 4th indeed marks the twenty-sixth year anniversary of the Tiananmen Square massacre in Beijing, China–when the communist dictatorship of that country quashed a political reform movement, which was begun by Beijing students who sought to bring about more freedom. At that time, other protests, in other Chinese cities, sprung up as well. Do you know about Chengdu? Twenty-five years ago, on April 15, 1989, Chinese students were mourning the death of a reformist leader. But what began as mourning evolved into mass protests demanding democracy. Demonstrators remained in Beijing’s Tiananmen Square, day after day, until their protests were brutally suppressed by the Chinese army — on June 4. Hundreds died; to this day, no one knows how many. The media captured some of the story of the massacre in Beijing. But Louisa Lim, NPR’s longtime China correspondent, says the country’s government has done all it can in the intervening 25 years to erase the memory of the uprising. Lim’s forthcoming book, The People’s Republic of Amnesia, relates how 1989 changed China and how China rewrote what happened in 1989 in its official version of events. 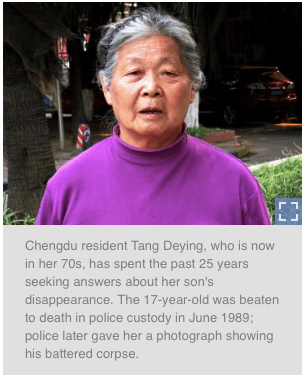 Her story includes an investigation into a forgotten crackdown in the southwestern city of Chengdu — which, to this day, has never been reported. It was in Chengdu, which is now a bustling mega-city with a population of 14 million, that Lim met Tang Deying (source). The People’s Republic of China (PRC) ended these protests by force — which, really, is the only way governments can ever resolve disputes of this sort, since government by definition is an agency of force. When it was all over, the People’s Republic of China began arresting its people on a widespread scale. They also went to great lengths to suppress protesters and other people of China who were supportive of the protesters’ cause. The People’s Republic of China banned the foreign press and controlled all later coverage of the event. Members of the Party who had publicly sympathized with the protesters were purged, with several high-ranking members placed under house arrest, such as General Secretary Zhao Ziyang. The violent suppression of the Tiananmen Square protest caused widespread international condemnation of the PRC government (Andrew Nathan, The Tiananmen Papers). The protesters — among whom were advocates of laissez-faire as well as disillusioned communists and Trotskyites and many other groups besides — were united only in their hatred of that oppressive regime. The Tiananmen Square protest was a protest against authoritarianism. It actually began some seven weeks before, on April 15th, 1989, after the death of a largely pro-free-market, anti-corruption government official named Hu Yaobang. Many Chinese people wanted to mourn his death because they regarded him as something of a hero. By the eve of Hu’s funeral, a million people had gathered in Tiananmen Square. Protests in Chengdu mirrored those in Beijing’s Tiananmen Square, with students mourning the sudden death from a heart attack of reformist party leader Hu Yaobang on April 15, 1989. This soon morphed into mass protests, followed by a hunger strike beginning in mid-May. Students occupied Chengdu’s Tianfu Square, camping at the base of its 100-foot-tall Chairman Mao statue and proudly proclaiming it to be a “Little Tiananmen.” The initial move by police to clear protesters from Tianfu Square on the morning of June 4 went ahead relatively peacefully. Soon the police moved in with tear gas. Pitched battles broke out in Tianfu Square. Protesters threw paving stones at the police; the police retaliated by beating protesters with batons. Eight people were killed that day, including two students, according to the local government’s official account. It said the fighting left 1,800 people injured — of them, it said, 1,100 were policemen — though it described most of the injuries as light. But U.S. diplomats at the time told The New York Times they believed as many as 100 seriously wounded people had been carried from the square that day. Protests continued into the next evening, and as June 5 turned into June 6, a crowd broke into one of the city’s smartest hotels, the Jinjiang. It was there, under the gaze of foreign guests, that one of the most brutal — and largely forgotten — episodes of the Chengdu crackdown played out after a crowd attacked the hotel (source). 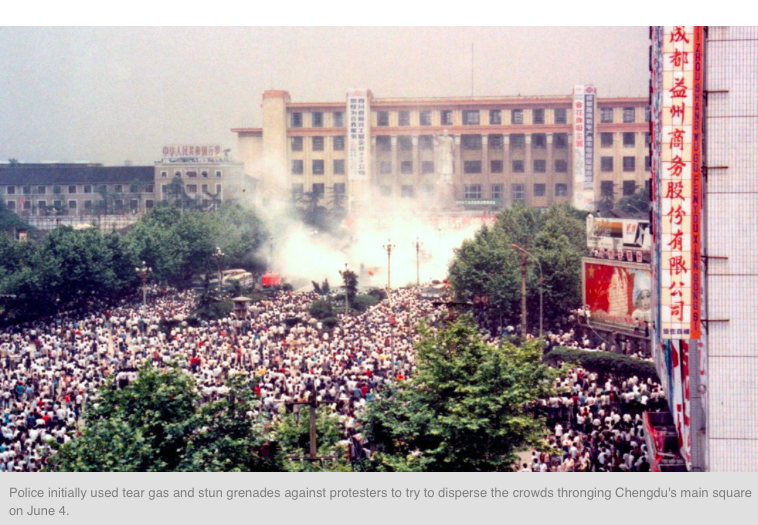 It isn’t known exactly how many people died altogether in these Chinese protests, although at one time the Chinese Red Cross gave a figure of 2,600 for Tiananmen Square alone, a number which they later denied. During those seven weeks, many of these protesters were openly discussing a principle that we almost never hear discussed even in this country — though it was this country’s foundational principle — a principle that is so profound and so complex that only a small minority of people today grasp its awesome logic. That principle is the principle of individual rights. China is an important example of a new society in which very interesting and positive things happened at the local level, in which a good deal of the collectivization and communization was really based on mass participation and took place after a level of understanding had been reached in the peasantry that led to this next step. It’s very good to see you here, Elvin. Had not heard of the connection between cities. Fascinating and moving piece. The pictures are a nice touch. A while? It’s been far too long.